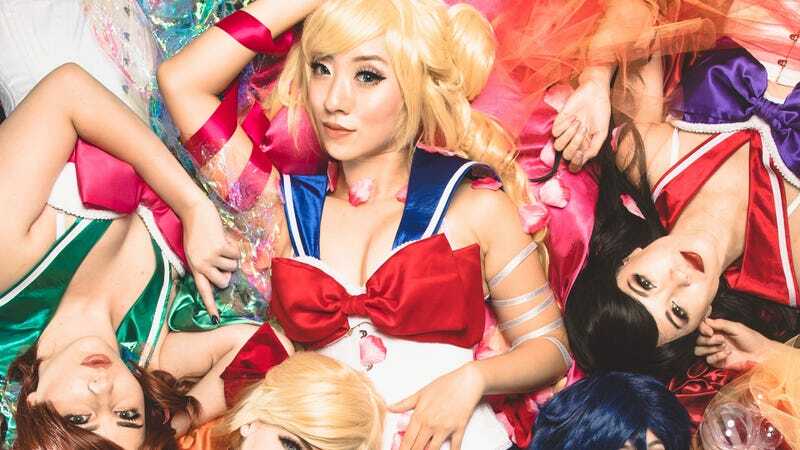 An all-star lineup of cosplayers, photographers and videographers have teamed up to imagine what it would look like if the stars of Sailor Moon had a more adult photoshoot. It was a reunion of sorts for CineCosu Studios’ Dominique Zamora, who assembled much of the same team we featured earlier in the year for a Sailor Moon x 90s fashion project. That means cosplayers Stella Chuu, Hendo, Akemi101xoxo, Maid of Might and Jynx are all reprising their roles. This time around, the boudoir shoot took place at Wonderland Studios, which was handy because it’s the same place that made the costumes. “The concept was meant to be a play on the scouts’ transformation sequences, wherein the girls’ clothes are removed and replaced by their individual elements”, Zamora tells Kotaku. “Inspired by the rose petal scene in American Beauty, we wanted to keep all the effects practical rather than using Photoshop, and had to get a little creative to make that happen. We used clear plastic Christmas ornament balls for Mercury’s bubbles, red, yellow, and orange tulle for Mars’s fire, iridescent cellophane for Jupiter’s lightning, a set of star string lights for Venus’s star ribbons, and of course, just regular pink ribbon for Moon. Below you can see the images produced from the shoot. A warning that some might find them a little NSFW.